The 700 range took over 5 years to develop. 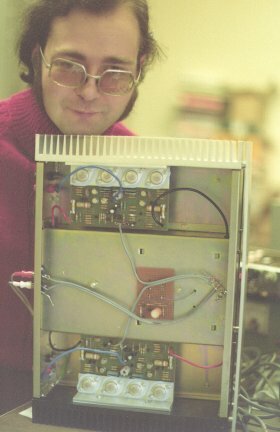 A lot of research went into issues like the effects of difficult loudspeaker loads, the influence of the power supply upon amplifier performance, etc. At an early stage the use of stabilised power supplies was considered for the 732. However these were finally rejected as it was decided that they actually degraded performance on musical waveforms. The two photographs above show the 732 during an early stage of development. The look of the designer, in the left hand picture, shows us that this was some time ago! The picture on the right shows that at this stage of development the center of the box had a metal channel that divided it into compartments. Hidden from view below the central channel was a stabilised power supply unit. 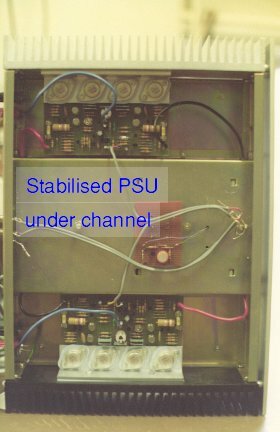 The main purpose of the metal channel was to shield the amplifiers from any fields or interference from the power supply. The channel was also intended to make the box mechanically stronger. Without a stabilised supply, the rail voltage would tend to be high when the average output power demanded was low. This gave extra ‘headroom’ and meant that higher power musical peaks could be delivered unclipped. Yet when continuous power was required, the rail voltages would fall, reducing the temperature rise of the output transistors and moving them into a safer area of operation. As a result, without a stabilised supply the amp would ‘play louder’ and actually be more reliable. A stabilised supply would increase the complexity of the design and introduced new forms of problem. For example, stablised supplies may exhibit oscillations or HF noise which then have to be dealt with. They may also current limit, impairing the amplifier's inherent ability to deliver current peaks. A stabilised supply could have given better measured performance in terms of allowing a higher continuous power, but this was felt not to be worthwhile. In general a stabilised supply can be used to protect the amplifier to some extent, from effects like rail-induced distortions and mains borne interference as well as from overload. However the basic design of the power amplifier itself meant that these features were not required. Hence all the design effort went into the amplifier itself and a high quality power supply based upon large reservoir capacitors and a high current mains transformer. 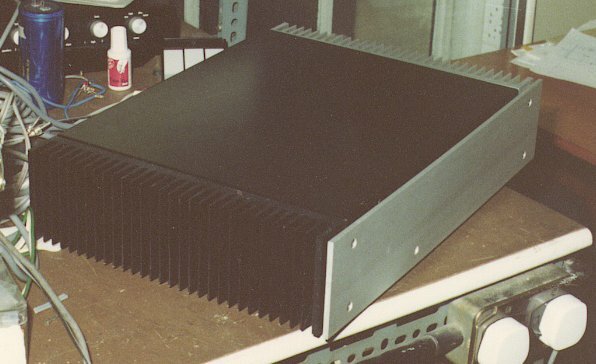 The above photo shows the amplifier at that stage with its lid in place. This shows more clearly that at this point the final colour and design were not settled. In particular, experiments were testing out the effect of the colour of the finish, type of finish, and shape of heatsink fins, upon thermal performance. Sadly, the 700 Range only went into production after Armstrong's Warlters Rd factory had closed down. At that time the company did not have the capital to start up a new factory and mass produce the units. As a result less than fifty 730/732 combinations were built and sold. For that reason they are now very rare. This rarity and their high performance make them something of a collector's item. using HTMLEdit and TechWriter on a StrongARM powered RISCOS machine.